Just arrived at D. Perry Motors…..
All with lots of VW warranty remaining!!! This vehicle is the perfect solution for your hatchback needs! Ranging from 36,000 to 48,000 kms these Golfs are very nicely equipped automatics with alloy wheels, heated seats and back up camera! You can enjoy one of these beauties for only $141 bi-weekly! 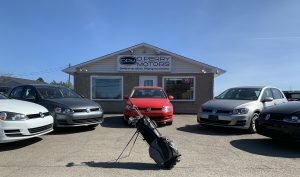 Contact us for the best value Golfs in the Maritimes!!! When you choose D. Perry Motors, you’re connecting with a company that has the knowledge and the know-how to make sure its customers get the most out of their vehicle and services. With that in mind we’ve set up a fantastic Specials area to show off all the currently-available offers. You may just find exactly what you’re looking for here at a price that can’t be beat! Come back often to see what offers D. Perry Motors has to offer you today.